stand’s base as shown in the diagram. to, programs, records, or data; nor any consequential or incidental damages, even if Targus has been informed of their possibility. 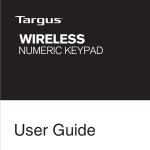 Group International, Inc. and Targus, Inc., Anaheim, CA 92806 USA.